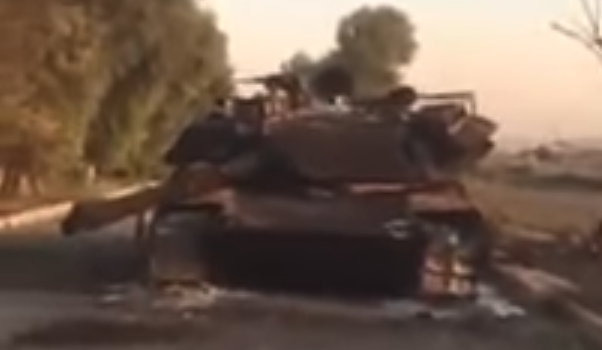 What Destroyed This Abrams Tank? On Oct. 20, 2017, the Kurdish Peshmerga claimed to have destroyed an Iraqi M-1A1 Abrams tank during fighting in Kirkuk province and took grainy video footage to prove it. It was an especially noteworthy clash given that Western allies supplied many of Iraqi Kurdistan’s anti-tank missiles and Iraq’s Abrams tanks. The Iraqi military’s Joint Operations Command accused the Peshmerga of targeting the tank with a wire-guided MILAN anti-tank missile launcher, which Germany supplied by the dozens to the Peshmerga for use against Islamic State’s up-armored suicide bomb vehicles. Iraq’s Kurdish region possesses few tanks of its own — older T-55s captured after the collapse of the Saddam regime in 2003, and no match for M-1s. Knocking out a U.S.-made Iraqi tank with a German anti-tank missile destined for the war with ISIS comes with political sensitivities. The Peshmerga denied using MILANs in the clash, and the German Defense Ministry would not confirm nor deny use of the missiles against the Iraqi tank. Germany has a contingent of military advisers in the region training the Peshmerga, a mission which Berlin briefly paused given the row with Baghdad. Iraqi forces and the Popular Mobilization Forces — pro-Baghdad paramilitary units — swept into the oil-rich Kirkuk region in October 2017 following Kurdistan’s Sept. 25 independence referendum. Outmatched by the larger Iraqi army, the Peshmerga retreated, but not without punctuating its collapse in Kirkuk with exchanges of fire. While the Iraqi government and the Peshmerga are at odds over the alleged use of MILAN missiles, both sides acknowledged the clash, which took place in Altun Kupri — also known as Prde — between the Kurdish capital of Erbil and Kirkuk city. We don’t know how the Peshmerga took out the Abrams, but the Kurdish army has tank-busting weapons other than the MILAN. One possibility is that the Peshmerga used a Chinese-made HJ-8 “Red Arrow” anti-tank missile. HJ-8s have appeared with the Peshmerga since at least 2014, although it’s not clear from whom Iraqi Kurdistan received the weapons. Sudan, Egypt, the United Arab Emirates and Pakistan are among the 19 countries which possess HJ-8s. Along with HJ-8s, the Peshmerga have been sighted with Chinese-made anti-materiel rifles and grenade launchers. Qatar is strongly suspected to have supplied Syrian rebel groups with these weapons after first buying them from Sudan, and the hardware could have eventually worked its way to the Peshmerga via captured Islamic State stockpiles, according to one theory from the weapons monitoring group Armament Research Services. 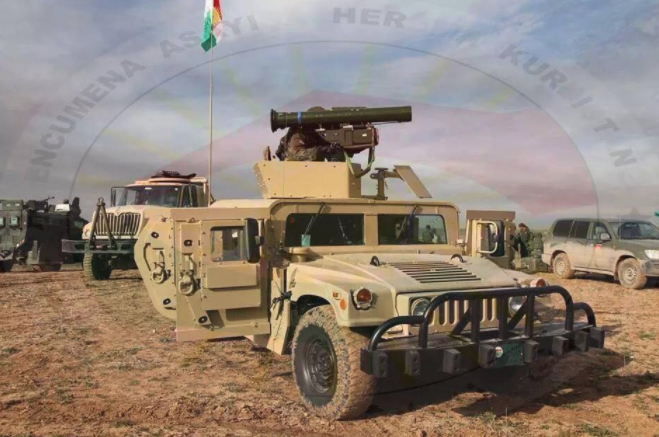 Social media channels aligned with the Kurdish separatist cause posted photos and videos showing tube-launched HJ-8s attached to Peshmerga Humvees. Interestingly, one recent video depicts Kurdish troops launching what looks like a vehicle-mounted HJ-8 during the clash at Altun Kupri. We don’t see the target. We do see the Erbil-Kirkuk checkpoint at Altun Kupri in the background. These same channels claimed an HJ-8 is what indeed took out the Abrams. If so, it would be a rare example of a Chinese-made missile destroying an American-made tank, indicating a vulnerability with the Abrams, as the M-1s supplied to Iraq lack the high-tech active-protection systems which are becoming increasingly common on modern tanks. The U.S. military’s Abrams are only now starting to receive those defenses. The wire-guided HJ-8 is an older missile first produced in China in the 1970s. It is roughly equivalent to the U.S.-made TOW missile. If the Kurdish missile was an HJ-8E — a more current version seen in Syria — then it would have featured a 54-pound tandem-charge warhead capable of traveling 4,000 meters, assisted by a thermal imaging system included on the launcher. A tandem charge is a two-stage warhead that can punch through a tank’s add-on explosive reactive armor tiles, although Iraq’s M-1 Abrams tanks also appear to lack this additional defensive capability. Helpfully and for posterity, the article included an aerial photo of the burned-out armored beast credited to the Kurdistan Region Security Council. Take a look for yourself.